This old district of Moscow is named after the village that once was here - Sushchevo, and there are streets with similar names here. 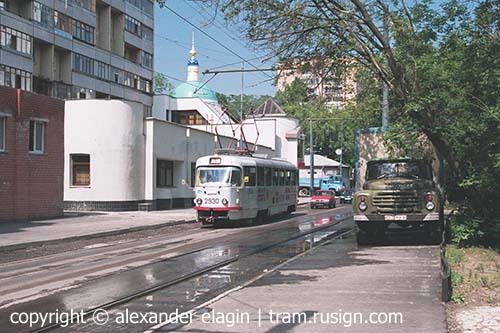 A tram line along Novosushchevskaya and Tikhvinskaya Streets was constructed in 1930's - it replaced a closed tramline along Novoslobodskaya Street. In 1933 the line was extended to great steel and heavy machinery factories in Novotikhvinskaya (now Dvintsev) Street. A short stretch of this not so long line from Minaevskiy Pereulok up to the Ulitsa Dvintsev loop was closed on 1 November 2002. A few sections of abandoned tracks could still be seen for a while but now all traces of that section are gone. Sushchevskaya Street. 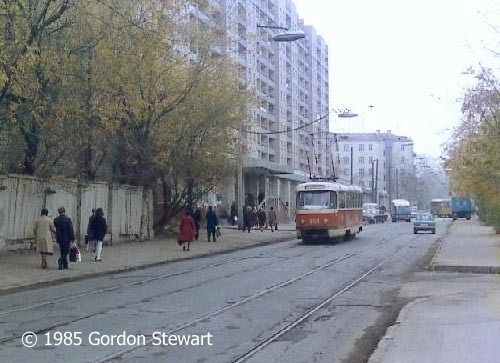 The tracks here were re-laid (they did need it, because their state was awful; it looked like they had no maintenance for many decades) in 1996, but tram operation was restored only a year later. 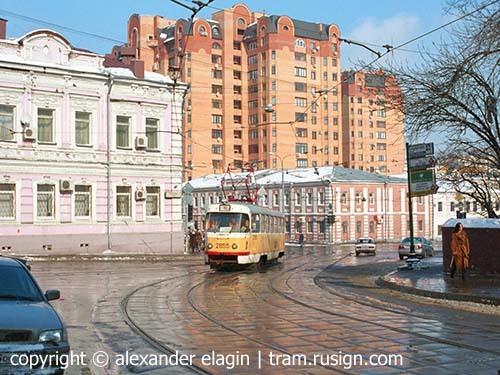 Today this line is served by route #19, the only self-crossing tram line in Moscow. 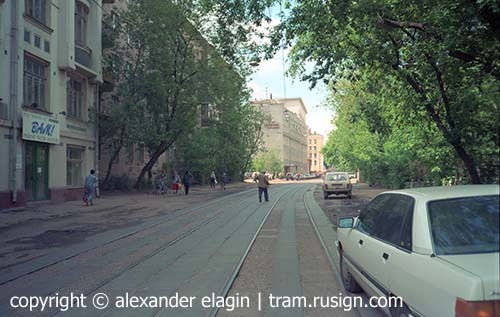 A crossroad with four tramlines: left - to Palikha Street, right - to Ploshchad Borby, forward - to Tikhvinskaya Street, and the last one is Sushchevskaya, just behind me. Tikhvinskaya Street after rain. This district was covered with modern buildings in 1970-80's. A hundred metres farther this line connects with a line in Minaevskiy Pereulok. This section of Tikhvinskaya Street has not changed much during the last decade. One can see almost the same view today as on this archive photo.